It has now been over two years since I first accepted the invitation to be Exactly Foundation’s first artist in their residency program and made a series of nocturnes of Northeast Singapore titled Northeast Hinterland. Alas, two years in Singapore is almost akin to two decades with the fast pace of development and change – much of the sites I explored and depicted have since vanished. When I was first invited to join the inaugural artist residency, I was drawn to its “micro-conversational” format, as I call it. Rather uniquely, the residency and its output placed focus on dialogue between art-making and an intimate audience in a private setting. The audience would then further host dialogue within their extended circles. Over a six month period (3 months art-making, 3 months dialoguing), over 200 text and visual responses were collected. The responses came from a diverse group from Raffles Institute students to elderly retirees. The Northeast Hinterland exhibition we opened on 13th July at Objectifs Centre for Photography and Film was an afterthought, but I’m happy to see the work exhibited publicly. 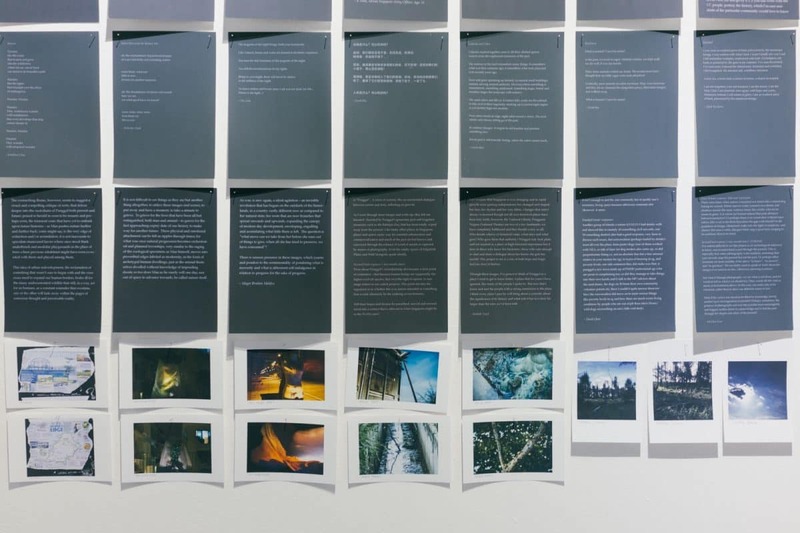 The exhibition, co-curated with Tom White, is presented as a work room, with prints pinned with penciled notes on the walls next to extracts from text and visual responses to the work. Archival documents and photographs of Punggol Zoo, Singapore’s first private zoo, courtesy of Lawrence Basapa, are presented as artefacts on two tables. An accompanying journal Northeast Hinterland, Thoughts about Land Custodianship in Singapore, published by Marshall Cavendish Editions and launched at the exhibition, is also available. The journal is edited by Li Li Chung with an opening essay by Tony Godfrey. The Northeast Hinterland exhibition is open at Objectifs Centre for Photography and Film till 23rd July 2017. Exactly Foundation will exhibit their following residency projects by Aik Beng Chia, Tom White, Lau Eng Seng and Kelvin Lim. “Making pictures of night has always been problematic. Partly this was technical: how can you show things in darkness? And partly this was existential: night was the domain of wolves and ghosts, malicious beings that could see in the dark. Not even in a town was it safe: to take a walk in eighteenth century London was a risky business, tripping in the uneven road or being waylaid by footpads were likely outcomes. Day was the domain of the sun and life; night of a moon that waxed and waned, and death. Nowadays streetlights, gas then electricity, good pavements and civic order have made walking at night in a town like Singapore a safe and pleasant experience. The power of night’s darkness is dismissed. The hostile darkness, that dangerous place outside civilization is exiled. Or is it? Does night still have mystery or power for us? And if so how can we represent it today? “These photos are blank. You can look at them and not see. If you go looking, you will not find what is depicted here. This is a shadow world, one in which ghosts of Sook Ching whisper in the waves and tigers roar in the jungle of the mind. These photos map a psychogeographic space upon which you can project what you wish. Look carefully through the images, the words and the documents here. Everything here is part of the larger conversation. This exhibit is itself a construction. A study without a researcher, with that role waiting to be played by each and every audience member who circles the room, absorbing. This map covers time and space, real and imagined, past, present and future and as such it is not yet complete. The world recounted here is a work in progress to which you can add. “Kevin’s photos invoke nostalgia. Ponggol was always special to my family, because of my grandpa’s zoo and weekend house on the water there, opposite Coney Island. The zoo was a casualty of the Japanese invasion. Its land, which was sold to a businessman, remained unused thereafter. It is still vacant. Ponggol seemed to be the loneliest part of Singapore, a trait Kevin’s photos captures because one see only shapes in them.. These photos enable me to imagine what I knew of Ponggol in the 50s, 60s, and 70s. In the 50s, there was the little Ponggol Hotel by the sea, near the new food complex. Next to it was a wood and stone house that let to families on weekends. We sometimes stayed at the hotel or the house. In the 60s and 70s, we owned a small half-cabin motor boat. I look at the portrait of Aida and remember the makeshift boatel, run by a Malay family, that cared for our (and other) boats. I lookat the seat shots and remember taking classmates and our girlfriends to Coney Island and Pulau Ubin in that boat. The photos of the wild dogs and boars, and of me – alone — on the zoo land, inspired me to remember the zoo, our family’s pride and the grandfather I never met. “This series of photographs of the Northeast Hinterland reminds me of my late mother’s recounts of her weekly visits to her uncle who lived in a 三巴(’kampung’ in Chinese) in the 1950s. It was not exactly in Punggol but at nearby Lorong Ah Soo. Her uncle – a former journalist with the now-defunct Nanyang Siang Pau – was a pro-Chinese Communist who frequently wrote leftist articles. To lie low from the government, he lived in a secluded hut with his family while waiting for the opportunity to return to mainland China. On weekends, my grandmother – with a basket of food and my mother in tow – would take tram No.4 to Upper Serangoon Road then walk the rest of the way to her brother’s kampung home. “You tell me these pictures are of Ponggol and think – yes. They have the right “flavor”. They remind me of the most important bomoh in Singapore during my boyhood. His name was Guan Bok. He lived in Lorong Buangkok and was in high demand, even in Malaysia and Indonesia. “But since the images were taken at night, I feel there are more questions then there are answers. There is an enigmatic quality to the images. Points in time with action in transition, but what is before & what is after is a mystery. “I remember the old Ponggol Road, the one that goes to Ponggol end. It’s also the road that one takes if you are heading for Coney Island by canoe or something. Coney Island was a watersport place but now it’s connected by bridge to the mainland and it’s part of a reservoir now. The Ponggol Road is still there, sort of truncated. I don’t relate to the pictures at all or to the Ponggol the pictures represent. The old landmarks are gone, and I just don’t recognize the place at all. The last time I went there (2 or 3 years ago), the old seafood place was gone. The new town has totally lost its flavor. So the photos just leave me indifferent to Ponggol. It could be anywhere. To another who had lived there, what Ponggol is now is totally alien. “Hey Papa, why the birds chirping? Will we go out walk today too? I see have many kids outside! Are we going to play? Can you give me my favourite treat? Can rub my chin and belly? Take a bath with me? What is like being that tall? Can I be like you? Papa, why you smile? Hey Papa, is another animal? Why is his trunk so long? Will we have more animal? Why there are more people coming to play? Are we going to keep people? What is the metal thing they give you? Why are you smiling? Why do he send paper? What do he complain? Hey Papa, why we move house? Can you give me my toy? Can you play with me? Why there are more people coming to play? Why are got shiny black boxes in the house? Why have man fighting with snake? Will people and snake die? Papa, are you smiling? Hey Papa, what is the sound? Why have so many people in the house? Why you stop smiling? Why do he shout? Why there have frown on your face? Hey Papa, why the birds chirping? Why your eyes water? Hey Papa, can you give me my favourite treat? Hey Papa, Papa, why you cover my eye? What is the sound? Why so red? Why so bright? Hey Papa, why it so dark? Why I cannot see? Why I no breathe?